More than 20 years later, an interview with Kathy Klotz-Guest at Content Marketing World brought to mind that Apple ad, which pressed into service images of some of the greatest leaders, artists, visionaries, inventors, and thinkers of the 20th century. Speaker, comic, and founder of Keeping It Human, Kathy responded to the question of how to create a culture that truly promotes creative ideas with answers that echoed the sentiments in the Apple ad. 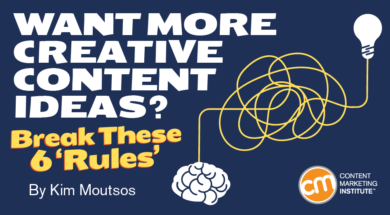 As you’ll see in the video below – the latest in CMI’s Mastering Content Marketing series – Kathy believes that the most interesting ideas come from flipping expectations on their head, breaking molds, and taking risks. Watch the two-minute video to hear Kathy, who trained at ComedySportz and Second City in addition to working in marketing for 15 years, explain in her own words. Then read on to find out what she recommends you flip, smash, and challenge. Here are six rules and conventions you should set about breaking and what to do instead to create a smarter content marketing program. Marketers often are scared of things that they can’t quantify or replicate. Too many companies, people, and teams buy into this template mentality: “I want to see what other companies do.” But you’re not that company. Your customers are different. Your path is different. Your story’s different. The best way to think about creativity is to ask: “How can we flip our customers’ expectations upside down to delight and surprise them?” Go to places where your competitors aren’t and do things they won’t. That’s where the good stuff is, the scary stuff. If it scares you, you’re doing it right. Creativity comes from asking “what if.” For example, “What if we go against assumptions and mash up two things that aren’t supposed to go together?” You might come up with amazing ideas. Creativity demands time to let ideas breathe. When you’re told, “We don’t do that here,” you need to go and do those things. The best stories don’t live in the C-suite, and they don’t live with marketing. Shocking, right? They live with customers. They live with partners. Who says you can’t put a story out there, or start a story and let your customers finish the story? Make your rules and experiment. Make sure teams understand they can take risks. Foster a culture where team members know their managers possess a have-your-back attitude when they do take risks. Companies must start with culture and take an attitude of “yes, and …” to create that environment. 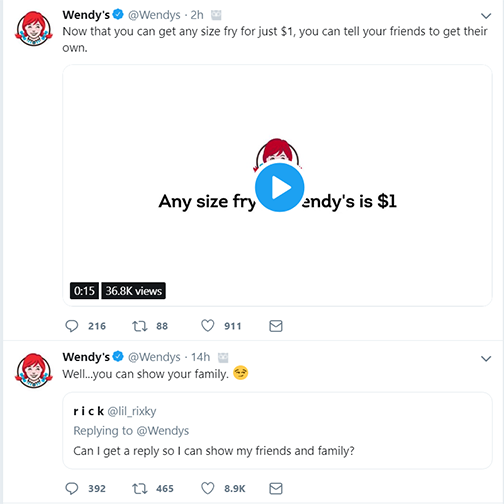 A good example is Wendy’s. The fast-food restaurant chain is killing it. Why is its social media team so darn good? It’s clear on its voice. And within the brand voice, the team has wiggle room to play. Reward learning. If all you do is reward the outcomes, you’re going to get people going for the easy, safe checkboxes. Imagine if you rewarded teams for how many ideas they generated. Not how many viable ideas, but how many ideas. Or you rewarded them for breaking silos and working with other departments to create new stories. Reinforce the behavior you want to see. Become a learning organization and an organization committed to curiosity versus just an organization committed to outcomes. HANDPICKED RELATED CONTENT: Is Your Corporate Culture Conducive to Content Success? What do you think? Is shaking up the status quo essential to truly creative content ideas? How do you get out of your safety zone to be creative? Let me know in the comments. Check out more opportunities to master content marketing. Watch CMI’s new video series. And consider attending in December one of the Master Classes in San Francisco, Chicago, New York. Register now.